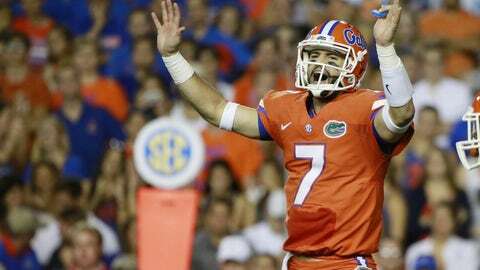 Will Grier will not be able to lead the Florida Gators to any more victories this season. This wasn’t the way things were supposed to go in the 2015 season for Florida Gators quarterback Will Grier. After leading the school to a surprising 6-0 start and a spot in the top 10, Grier is done for at least the rest of the year following a suspension for PED use. His story is not mine to tell. But I do know the facts. I do know that his mistake was one of naivete, not of malice. I do know that he had no idea that he had done anything he thought was wrong, let alone the NCAA. When I saw my son walk to that podium to tell a room full of adults that he was sorry for his mistake, I knew that Will had used the game to become a better man. He is the calming voice in our family, assuring all of us that he’s OK and that God gives his toughest battles to his toughest soldiers. He doesn’t see his world falling apart, he sees his world changing and he is ready to embrace it and tackle it with the same ferocity as his teammates have been attacking opposing offenses.